Peons are the lower grade employees under any governmental and non-governmental organisations. In governmental organisations Peons are said to be class IV or category D employees. The job profile of the peon is to transfer files from one table to another, take notes of the visitors and also assisting in some odd jobs in any organisation. As mentioned that the peon falls under the lower grade employee groups, the basic pay scale of the peons is also quite low. 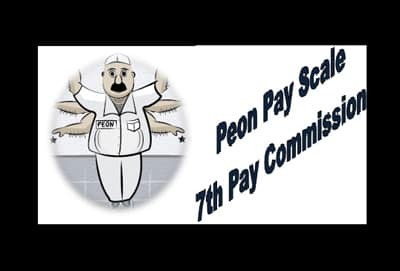 Here in this article we will discuss about the pay scale, salary and the grade pay of the peon in government organisations. Peon falls under the class IV employees’ group. So technically their pay scale falls under the Pay Band 1. The basic pay scale of an entry level peon starts from Rs. 5200/- and can grow up to Rs. 7000/- per month. According to the Pay Band 1, the range of the pay scale of any employee falls under this band starts from Rs. 5200/- to Rs. 20, 200/- per month. One entry level peon draws pay scale of Rs. 700/- per month at the max. As mentioned that the peon falls under the pay band 1. So the expected salary of the entry level peon is Rs. 5200/- per month without grade pay. The salary of the peon can be different depending upon the organisation they work. The average monthly salary of an entry level peon is Rs. 5200/- + Grade Pay. The class IV employees such as peon as mentioned in this article fall under the Pay Band 1, the grade pay of the peon from any government organisation is fixed at Rs. 1800/- per month. So an entry level peon draws total salary of Rs. 5200/- + Rs. 1800/- = Rs. 7000/- per month. As per the rules the peon gets increments during their service. One increment means 3% of the salary hike. According to the recommendation of the 7th pay commission, the salary of class IV staffs must be raised by 30%. That means the salary of the peon will be 15600/- per month which is 30% more than the current salary 5200/-. The entry level salary will be Rs. 21, 000/- per month instead of Rs. 7000/- per month. According to the report of the 7th pay commission, the salary of the peon under central government has risen up to 23.55% instead of 30% per month.